You never know what you’ll see when you’re driving around San Francisco. 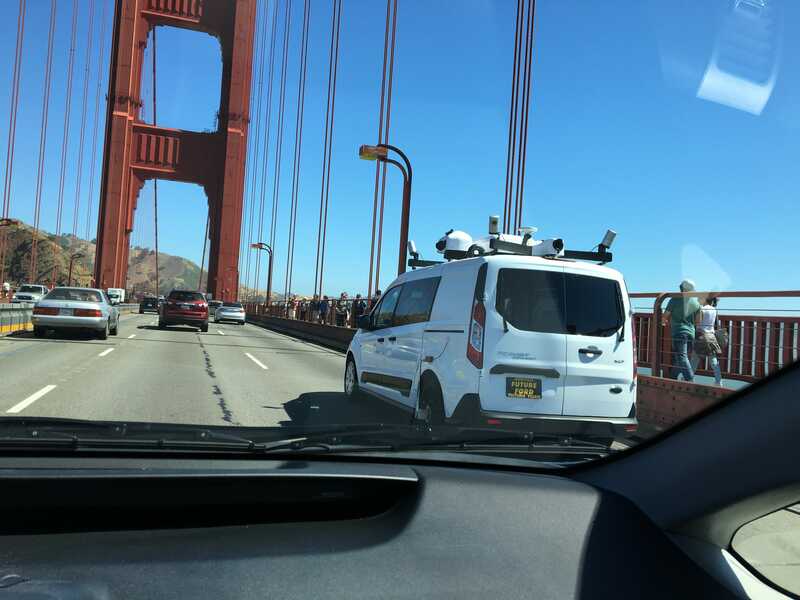 And during a drive over the Golden Gate bridge on Saturday, we spied this curious looking vehicle. The high-tech set up on the roof makes it obvious that this van has a special mission. 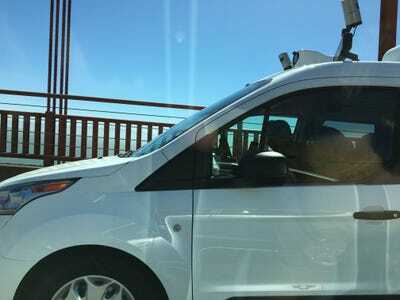 Anyone who has seen one of Google’s self-driving car prototypes will recognise some of the hardware. Let’s get a little closer. 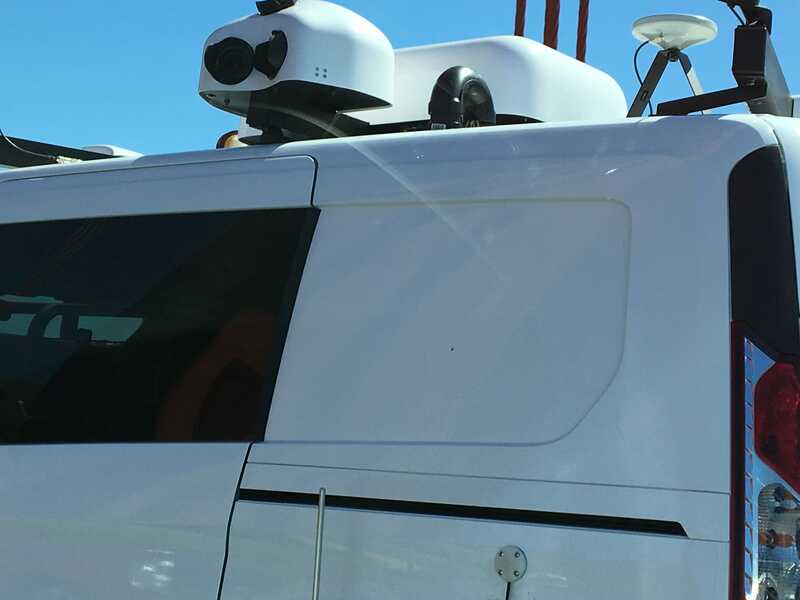 Among the collection of gadgets on the roof are the spinning Lidar laser sensors often used for self-driving cars. There are also cameras on the roof. And there’s a large antenna above the rear wheel. Yet this car has no obvious markings or insignia to identify it, not even a licence plate. Is this a self-driving car prototype? Or is it a vehicle with some other purpose, such as creating high-definition digital maps? Which company’s car is this? 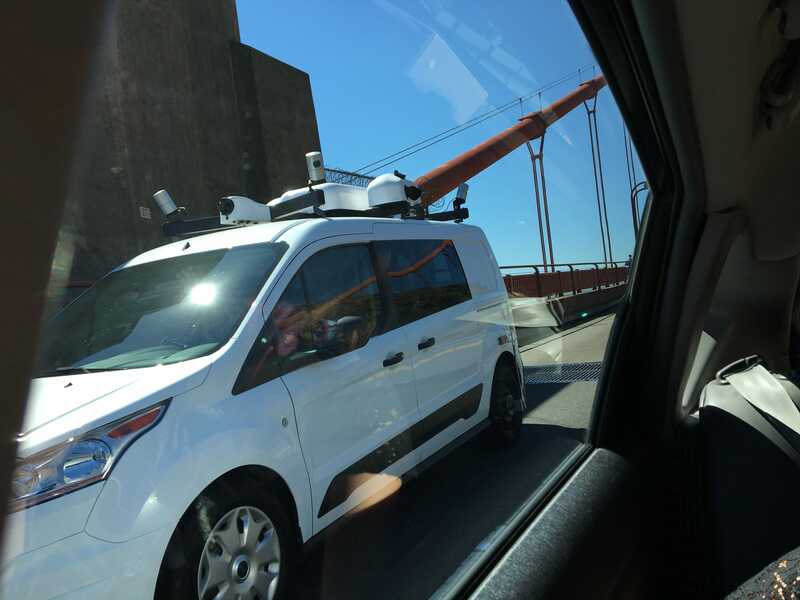 One knowledgeable source in the self-driving car industry reckons this is an Apple mapping car. 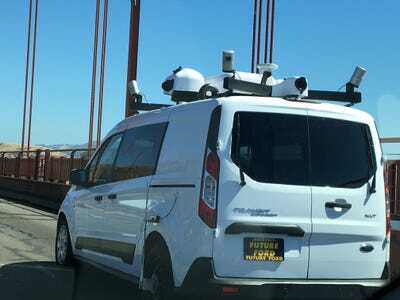 Indeed, the van, a Ford Transit, looks very similar to other previously-spotted vehicles suspected of being affiliated with Apple. 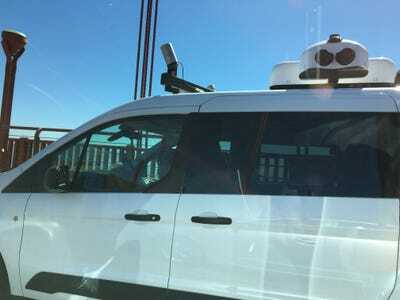 Apple has special mapping cars that are loaded with sensors and cameras, but these have often been clearly identified as Apple Maps cars (and are usually Chrysler vans). Apple has a special website that lists where its Apple Maps vehicles are rolling throughout the world at any given time. The site lists San Francisco as one of many locations for the period of June 20 through July 3. But…the list of locations has been virtually unchanged for the past year. Apple is also reportedly working on self-driving cars, though the company has never officially acknowledged it. According to our source, the gear on top of the car appears complex enough for a mapping vehicle but not necessarily for self-driving car. The driver also has her hands on the wheel. That doesn’t in itself disqualify it as a self-driving car of course, but it’s telling — a straight drive on the freeway like this would typically be prime territory for a car to show off its autonomous driving skills. If you have any insight or theories about this car, we’d love to hear from you.